The speculation surrounding some of the features that the innovative product from Google codenamed “Project Glass”, has come to an end after it was revealed that it could be controlled using a track-pad located on the right hand side of the device from the user’s point of view. 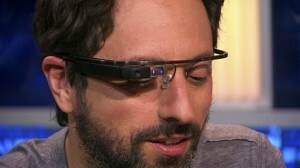 The track-pad is on the arm of the glasses, directly next to the lens which would be providing the visual elements to the user. The track-pad location explains why the right side is considerably more bulky in comparison to the left. It is safe to assume that it has more functions than simply being a way to control the movement of items shown to the user through the lens. This was all revealed during a television chat show in the US called The Gavin Newsom Show. The show is set to air on Friday, where viewers will witness the host as well as lieutenant Governor of California become some of the first people outside of Google to try the device on. The co-founder of Google Sergey Brin, along with his wife the co-founder of gene-mapping startup 23andMe, Anne Wojcicki, featured as guests on the TV chat show. From the clip that has been shared it can be seen that Brin is able to snap a picture of the host (apparently hands free) before handing it to the host to check out first hand. It is at this point that it becomes apparent that a track-pad is a part of the control system used by the augmented reality device.It is unknown whether it is the main source of control for the device. After Brin has let the presenter have a go at looking at the device first hand and the picture that was taken, he goes on to talk about Google’s X lab. This is the location where Project Glass and many other innovations by Google are being thought up. The current Project Glass devices are apparently only prototypes, with the hope of the finished product being released to the general public sometime in the next year. The news that the device most likely won’t be ready to be released by the end of the year is music to the ears of companies such as Apple and Samsung who are leading figures in the smartphone market. The Samsung S3, which has just been released, is the latest device to come from the electronics giant. It comes complete with a variety of applications and uses that rival Apple’s iPhone 4S. However Apple is yet to announce when the latest smartphone designed by them is to be released. It is expected to be later in 2012, although there are rumours of an announcement in June. With established smartphone suppliers like Apple and Samsung, breaking into the market with a new technology might be difficult for Google to pull off, even with the large financial backing that they carry. As some speculation surrounding the Google’s Project Glass ends, new speculation begins, as people begin to question whether the device will truly be a match for a smartphone even with its hands free capabilities. For more conventional smartphones like the new Samsung S3 visit mobilesplease. Compare mobile phones from the leading retailers and operators in the UK.